The FCHC Heart & Vascular Center is committed to providing superior vascular imaging and treatment capabilities within our community. 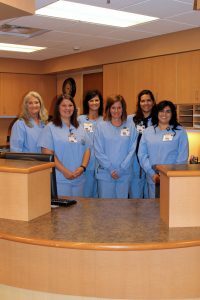 Our staff strives to provide outstanding, compassionate care unique to each of our patients. Our Vascular Center offers a broad range of minimally invasive procedures aimed at assessing blood circulation. A common disruption of circulation is Peripheral Arterial Disease (PAD). This is a progressive condition that causes narrowing or blockages of arteries within the arms, legs, neck and abdomen. These patients can experience a wide range of symptoms including pain, swelling, numbness, change in skin color and poor wound healing. To diagnose PAD, x-ray dye is administered through a catheter placed within the blood stream, allowing the doctor to determine the extent of disease. 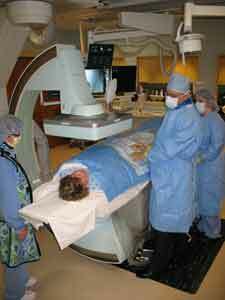 This type of x-ray procedure is referred to as an Angiogram. Using these results, the doctor can recommend a plan for treatment. Balloon Angioplasty – A miniature “balloon” is inflated to widen the narrow segment of the vessel and increase blood flow. Atherectomy- The plaque inside the artery is removed (shaved) from the wall of the artery to restore blood flow. A fistulogram is a specialized angiogram used to visualize and restore the blood flow within the fistula (access site) for dialysis patients. We also perform the insertion of tunneled catheters to prevent disruption to their dialysis treatment. Our Vascular team is also specially trained to use ultrasound guidance for a variety of vascular access needs. This ultrasound technique can be used for patients who have difficult IV access or patients requiring specialty IV’s (PICC lines or Midlines) used for long term therapies. Loop Recorders – implantable heart monitors that detect irregular, fast or slow heart rhythms. Transesphogeal Echocardiogram (TEE) – an ultrasound procedure viewing the structures of the heart. This is performed from inside the esophagus, whereas a traditional echo records images from a probe outside the chest wall. Cardioversion – is performed to assist the heart to return to a regular rhythm. Many times, this is done for patients in Atrial fibrillation who experience shortness of breath or fatigue. Pacemaker / Internal cardiac defibrillator – Pacemakers are used to help control abnormal heart rhythms. Internal cardiac defibrillators are used to detect dangerously fast heartbeats and give a lifesaving shock to correct the heart rhythm. For more information, please call 419-337-7314.